Art show, full menu and wine tasting: $75.00 USD per person, all-inclusive. Reservations are strongly suggested and greatly appreciated. We have commissioned 35 Sicilian artists to create 70 unique wine labels exclusively for our event featuring Sicilian wines and food. The theme of the labels is "Red and White". 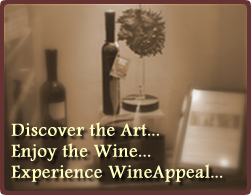 Each of the labels represents an original work of art to enrich your art collection, your wine cellar, and your life. They are also an excellent value and opportunity for collection and gift-giving. The wine labels will be affixed to a variety of purely Sicilian wines selected by Vanvakys and provided by American importers and distributors. The base price of each bottle is $100.00 USD, and all bottles will be placed at auction (silent) at that starting amount. Bids can be placed online, click here. Enjoy "Art in a bottle" and know that you are contributing to a very important cause: percentage of proceeds will benefit The Leukemia and Lymphoma Society New York City Chapter. The food and wine tasting is designed and planned by Vanvakys Art International in collaboration with Naima. A price fixed four course meal, with a choice for each course, is offered to all guests and includes a taste of either red or white wine for each savory course: antipasto (appetizer), primo (main course), secondo (second course), and a choice of either Rosolio or Dessert Wine for the Dolce course. A typical tasting amount is generally two or three sips. Upon tasting the wines, guests are welcome to purchase bottles at promotional prices exclusive to the event. Sponsors and guests will have the opportunity to admire the artistically-labeled bottles on prominent display in the dining room at Naima throughout the dinner events, online and at a yet-to-be-determined location of similar prominence and significance. Bids will be accepted via telephone, fax and email and collected in a central directory. The auction will end in February 2009. In order to take part in the auction, bidders will complete a bidding form and provide personal contact information, including a credit card number, in order to ensure adherence to bid amounts and fairness to all. Bidders will indicate the number corresponding to their bottle(s) of choice, as well as their offer ($100USD minimum). Bidding forms can be found online and can be or printed and faxed to +1 (201) 387 0886. Bottles will be gift-wrapped and presented to winners along with an auction catalog along with any eventual gifts and gadgets donated by event sponsors. Vote your favorite label associated with the bottle and you can win a faboulus big value case of 6 bottles of first quality Sicilian wines. From time to time, the winner will be sorted within those who voted those labels which will result the most voted ones. Find out how! In this first part of the event, the winner is Mr. John Licci from New York whose name was sorted within the voters of Vanni Quadrio whose labels are the most voted ones. Phone: +1 (917) 406 4102 Fax: +1 (201) 387 0886.